When a disk partition is given format using ext2, ext3 or ext4, the filesystem reserves a 5% of its capacity by default for root-only processes to use. It is done to avoid filesystem fragmentation and to allow system daemons to continue writing to the filesystem even after non-privileged processes can’t. This is a good thing to have by default, but a 5% means 25GB on a 500GB drive and that’s too much. NOTE: It is not recommended to free all the reserved space on your / partition. 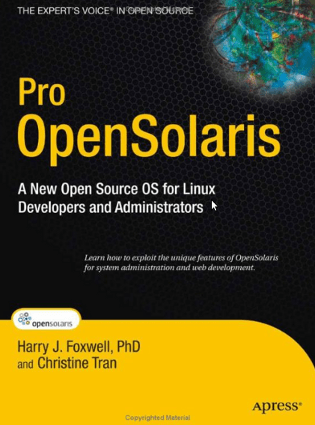 Yesterday, I finished reading “Pro OpenSolaris. A new Open Source OS for Linux developers and administrators“. It introduces the main differences between OpenSolaris and GNU/Linux (SMF, ZFS, zones and containers, Dtrace, etc). It explains all this things from a GNU/Linux user perspective, so if that’s your case, it will be easy to read for you. I missed some other comparisons between common GNU/Linux commands and their OpenSolaris equivalents, but it would have increased dramatically the number of pages of the book. A nice book to start using OpenSolaris. Rootkit Hunter is released as GPL licensed project and free for everyone to use“. Download the latest version from its web. To obtain valid results, be aware of false positives (check warnings twice) and keep it updated. Remember: security is a process, not a state. Since Trac uses a database backend (SQLite by default), you can’t just copy its files to make a backup. The tool trac-admin includes an option to do this. It will lock the database and make a live copy of your Trac environment to the specified directory. It must NOT exist, otherwise an error will appear (Command failed: [Errno 17] File exists). Once you have made this live copy, you can create a backup of this directory using your favourite backup system. To restore a Trac backup: stop the process running Trac (usually Apache), copy the content of the backup directory to your Trac environment and restart the process you use to run Trac.